I made (mimick) dolsot bibimbap today. 🙂 Dolsot by the way, means stone pot. Since I don’t have a stone pot, I used an earth pot- something that people often use for Korean soft tofu spicy stew/hot stews. Now I know that some people might criticise and say that these are not “authentic enough” looking or just looks different to YT vidoes on bibimbap, but the truth is that even in Korea, there are many types of bibimbap. For me, bibimbap is still a bibimbap! 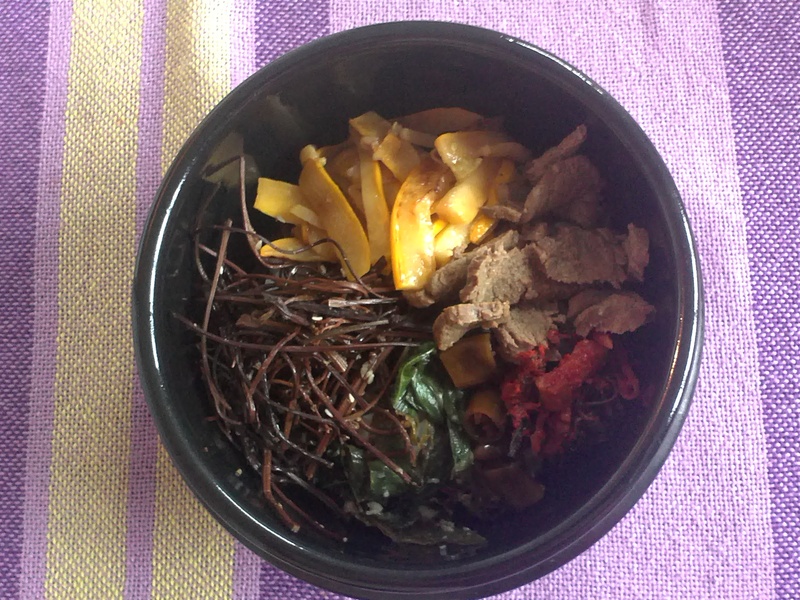 -sauteed yellow zucchini (organically grown), edible gosari aka baby bracken marinated, dried and then marinated white radish in Korean chilli powder, blanched and then marinated perilla leaves, tender beef strips marinated in soy sauce/sesame oil/honey. 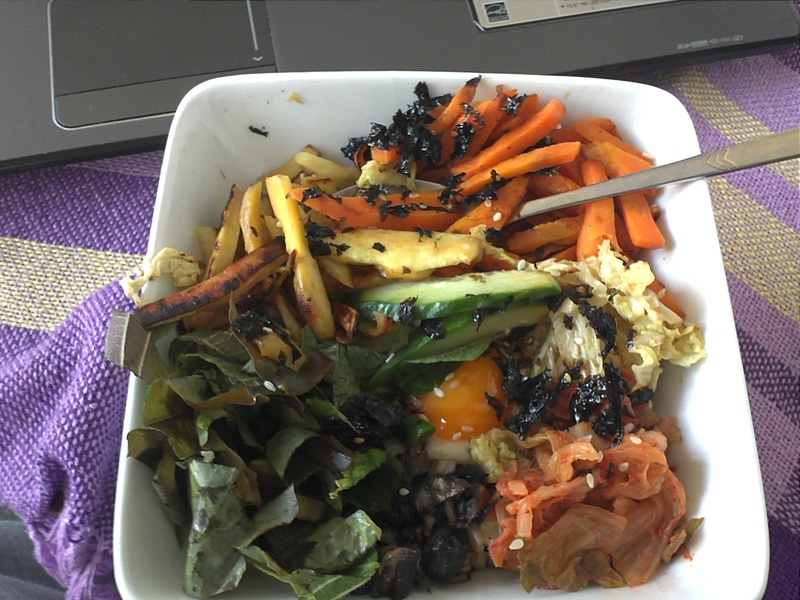 -fresh lettuce, sauteed sweet potatoes, fresh cucumber, sauteed carrots, an egg, some left over kimchi (which i think she was trying to get rid off 😛 ), an egg and some toasted, crunchy seasoned laver sprinkled on top (marinated in sesame seeds and sesame oil). 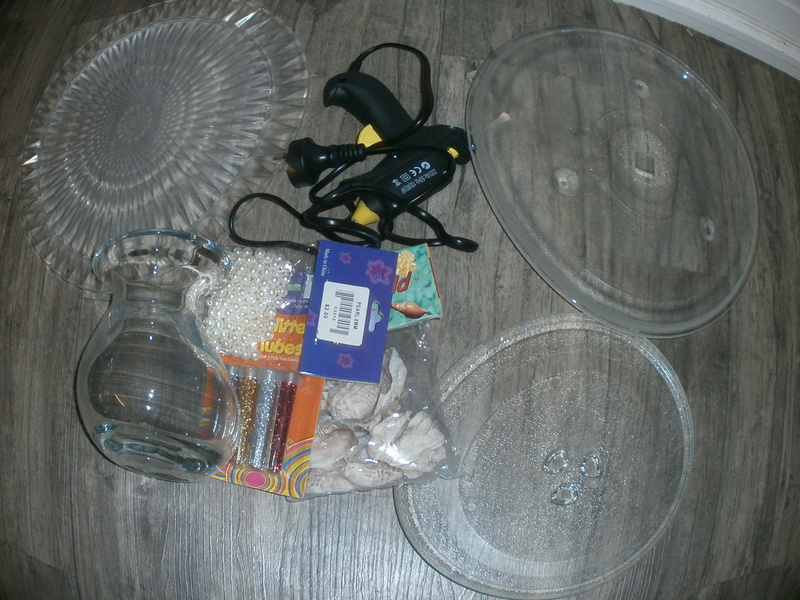 What you need: A glue gun, 3 different plates (glass or glass looking). 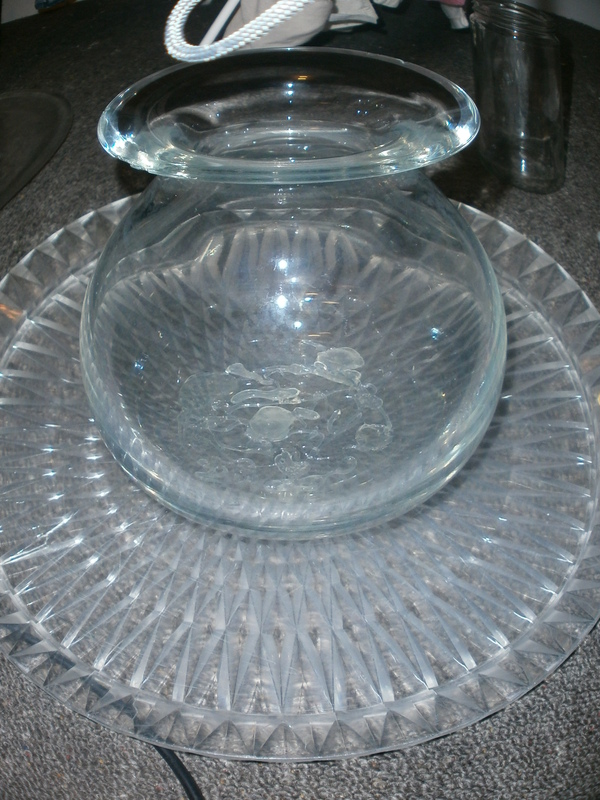 A strong solid vase to use as a base (as in the picture), plus one more jar (forgot to include in the first picture). Long(sh) is good to give the whole structure some sort of height. 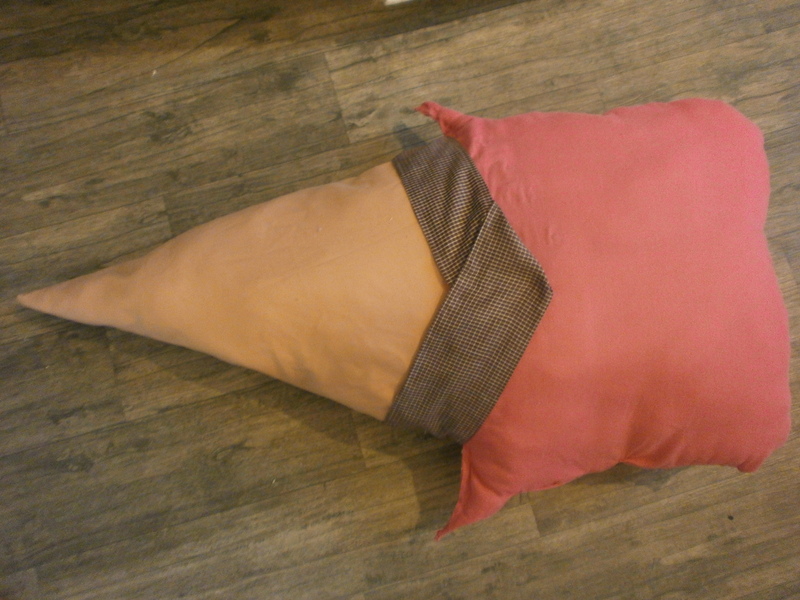 What you need: Pink pillow case, some fabric that is ice-cream cone(sh) in colour, 10cm x 15cm of brown-checked fabric, a glue gun, pillow-stuffing, some needles and some thread. 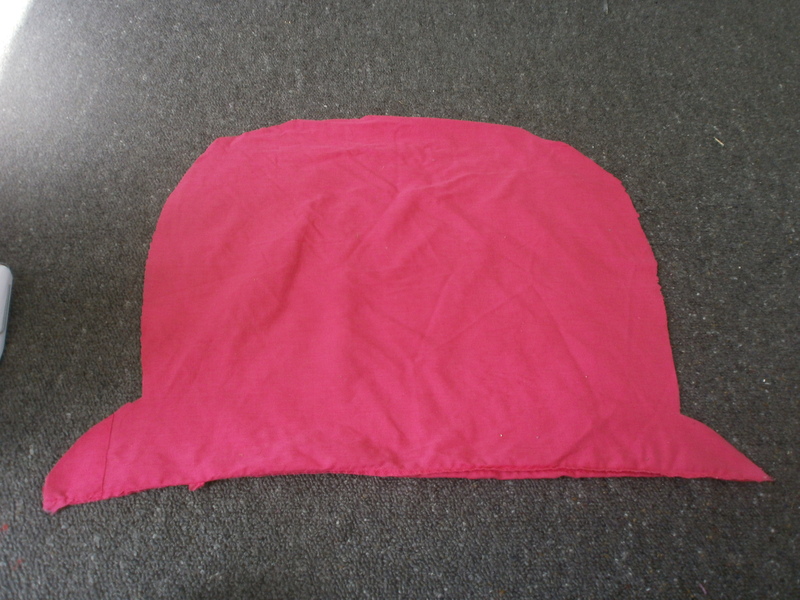 For sprinkles: Small fabric parts of many colours. Now, in my opnion, the video is made really well. She gave clear instructions and everything is pretty much straight forward. 🙂 What I am going to attempt to add today are the minor details, from the view point of someone who actually DID attempt to replicate what she did in the video+ add my own twist. Hope this helps anyone thinking of making something similar! 1. 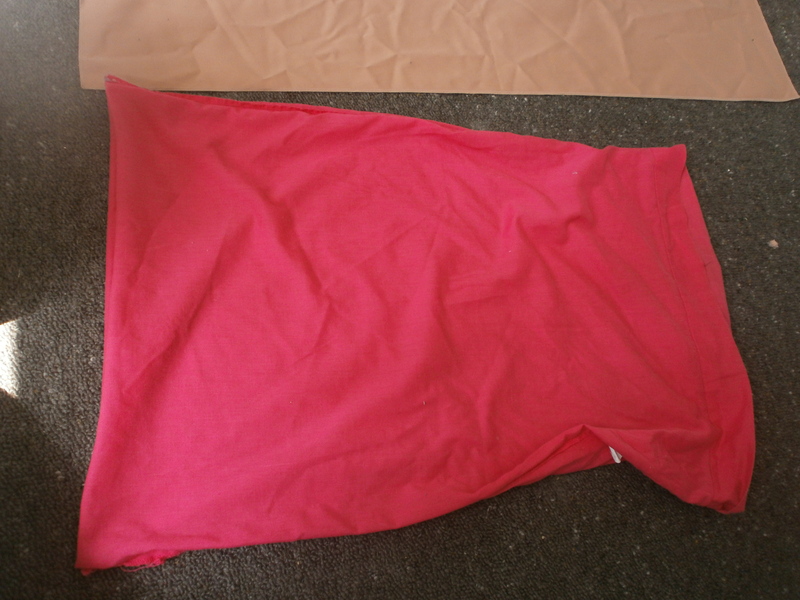 Instead of buying expensive fabrics from a fabric shop, I found these in a second-hand shop: a pink pillow case and some fabric(probably deemed dull in colour, hence priced 10 cents). 2. 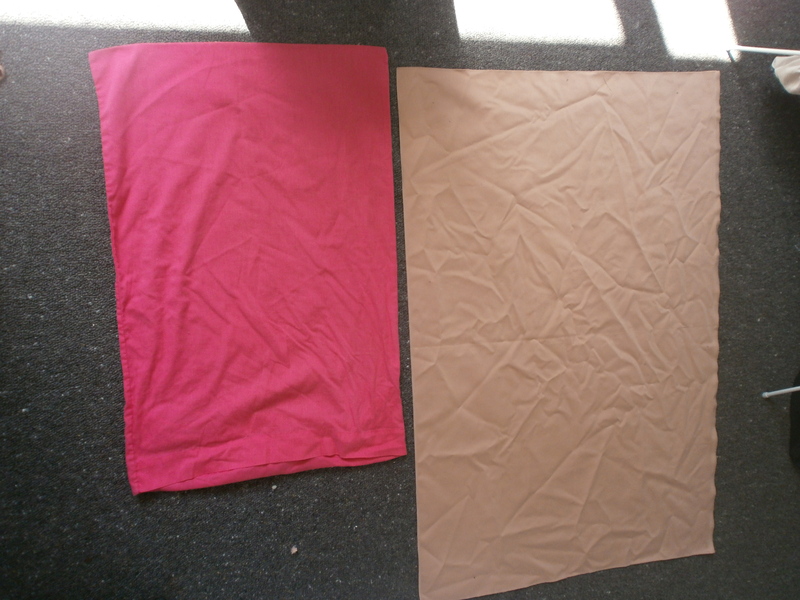 I washed these and put them in the dryer just to get rid of any dirt/stain etc. 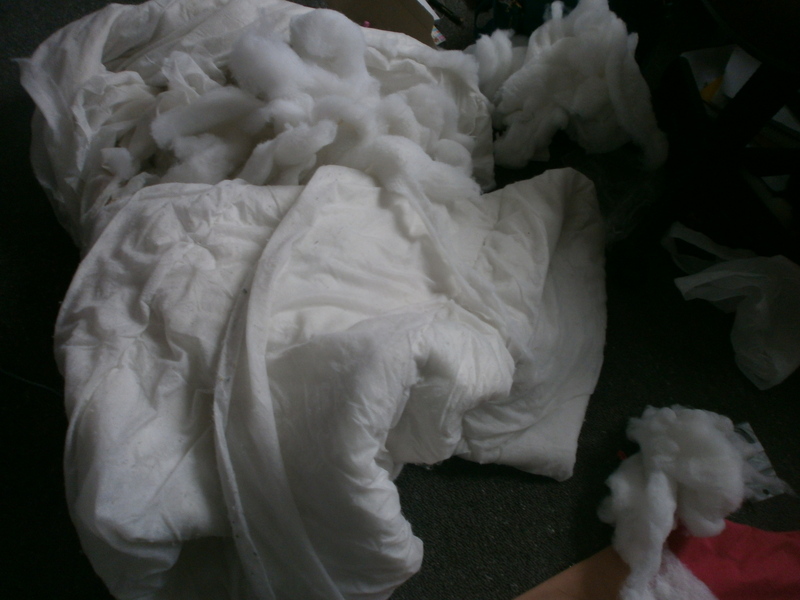 I then turned the pillowcase inside out. 3. Now I know that in the video, she was able to draw with a free-hand. 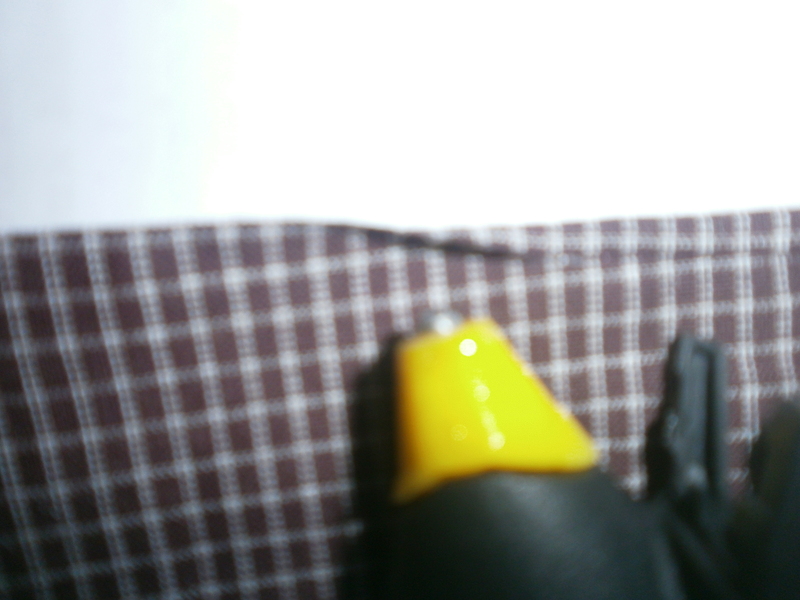 However, I am not very good drawing things evenly- nor just good at drawing to start off with! 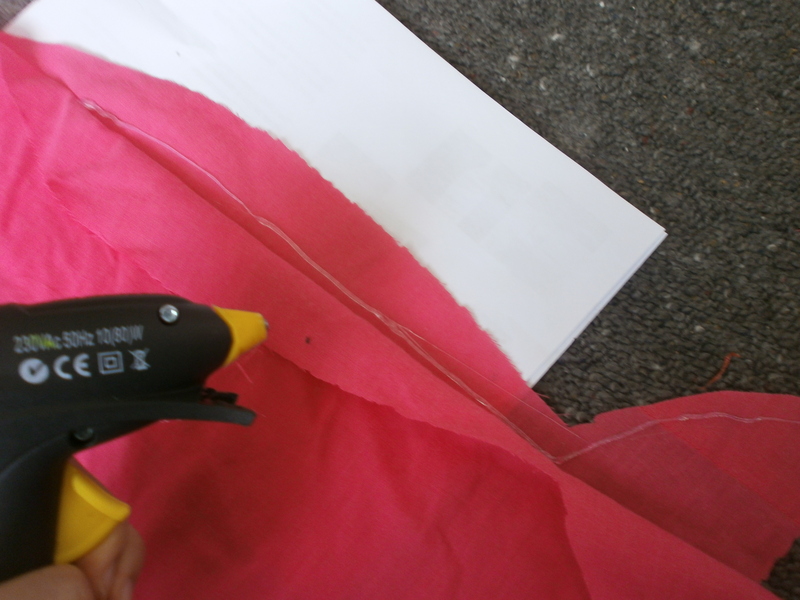 So to make sure that I got some sort of symmetry at the end before the scissors went snip, snip, I chose to measure each side by height vs width. 4. 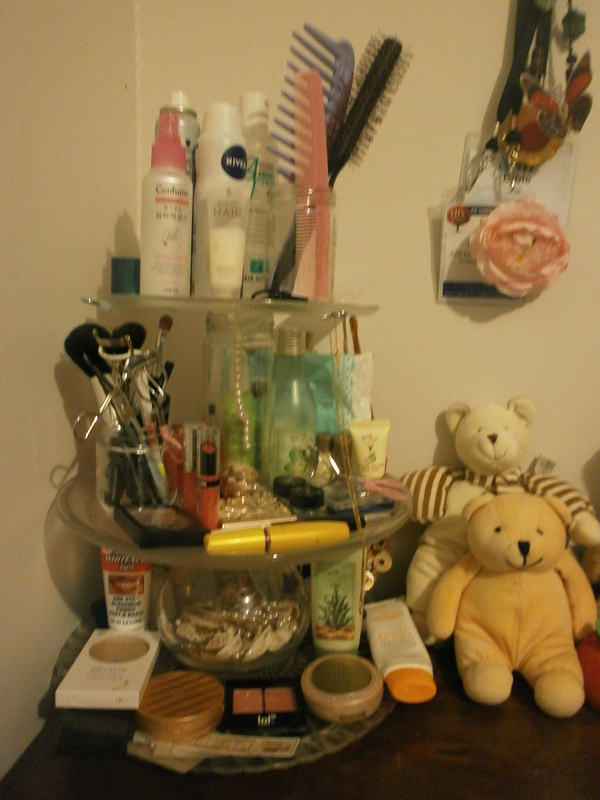 This is what I ended up with. 🙂 5. 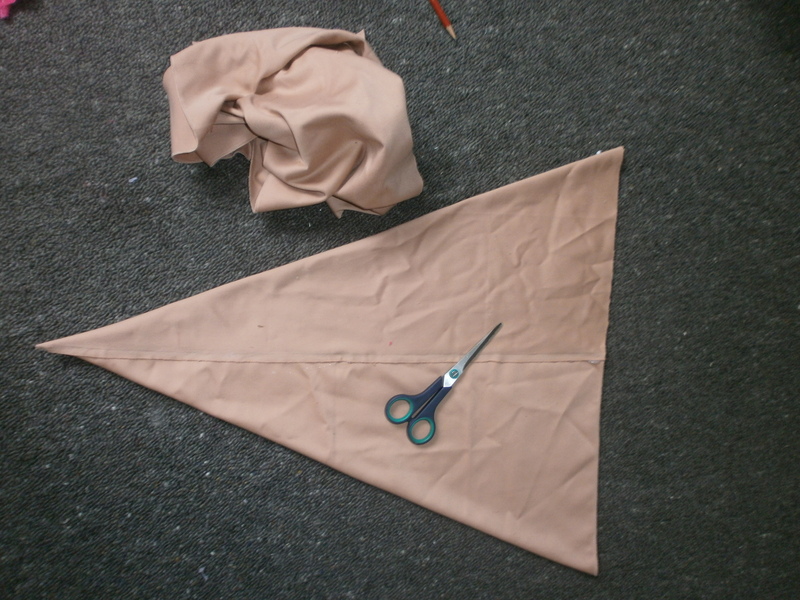 I then tried folding the caramel coloured fabric until it looked like a cone. 🙂 Remember to glue the edges from the INSIDE out! 8. 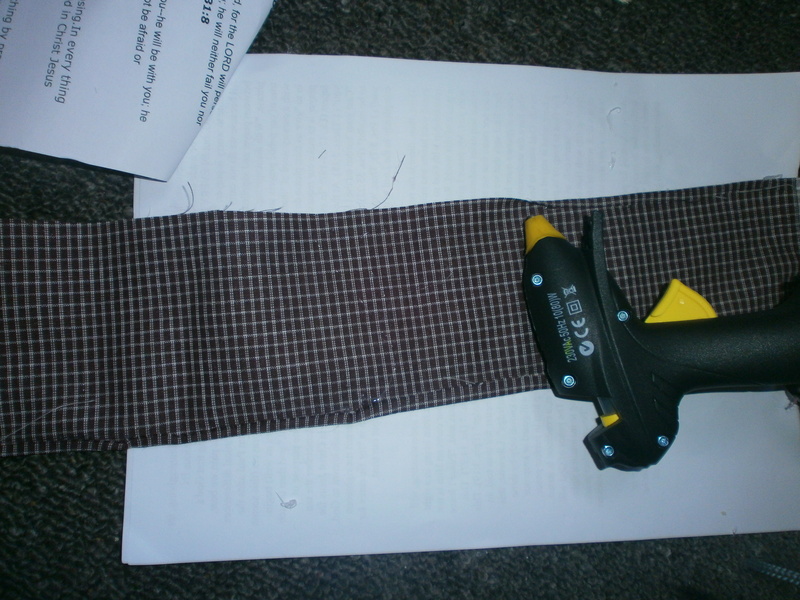 Once the pillow was completely sealed, I then cut up 10cm x 15cm of the brown fabric and glued the edges to seal it with the glue-gun. 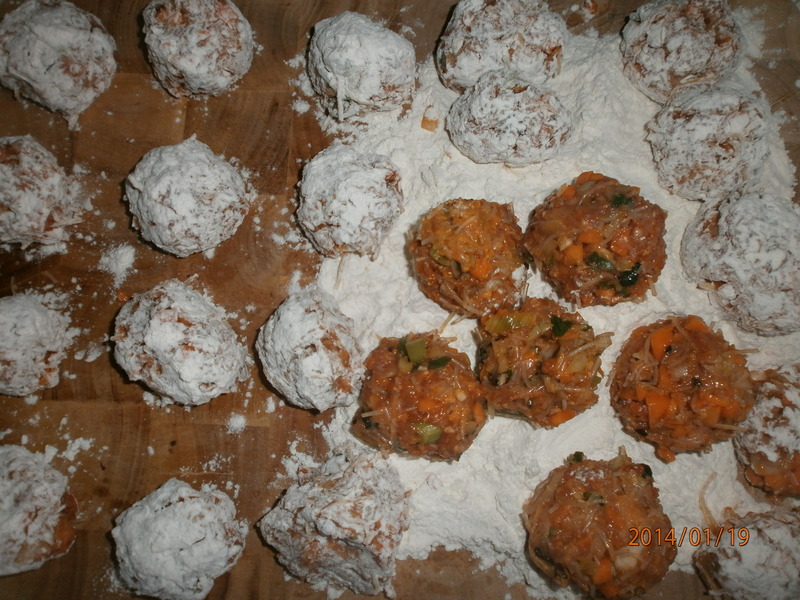 Ingredients: 60g of pork mince, 1 carrot, minced garlic, spring onion, 2 button mushrooms, 1onion, light-soy sauce, white vinegar, sesame-oil, Korean Chilli flakes(optional), gochujang(Korean hot chilli paste),plain flour. Now I know that I am uploading somewhat-randoms, atm. But if there are any YT cooking videos you have seen many times, but have never really bothered to replicate (but would like to kinda see if the recipe actually does work), please make sure that you let me know! 😀 I will be more than happy to try! OK so. 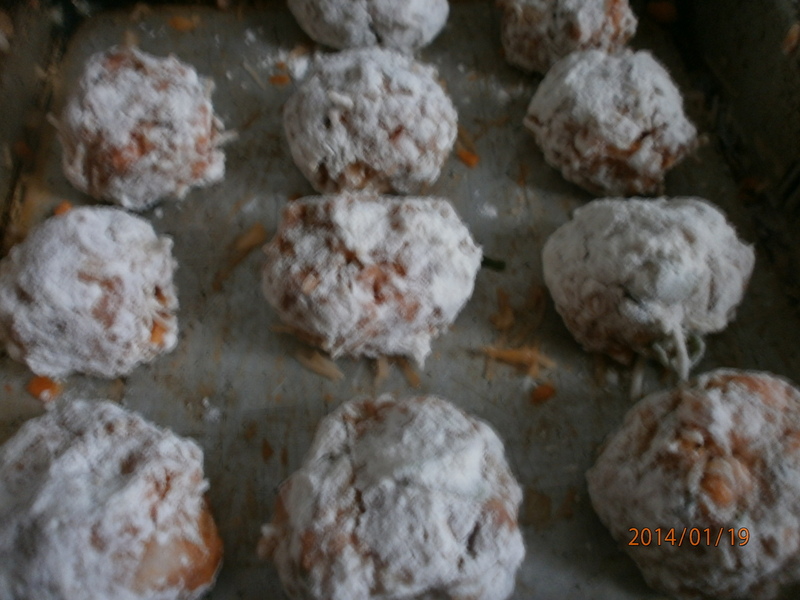 My plan was to upload a fool-proof macaroon recipe, as my second post. 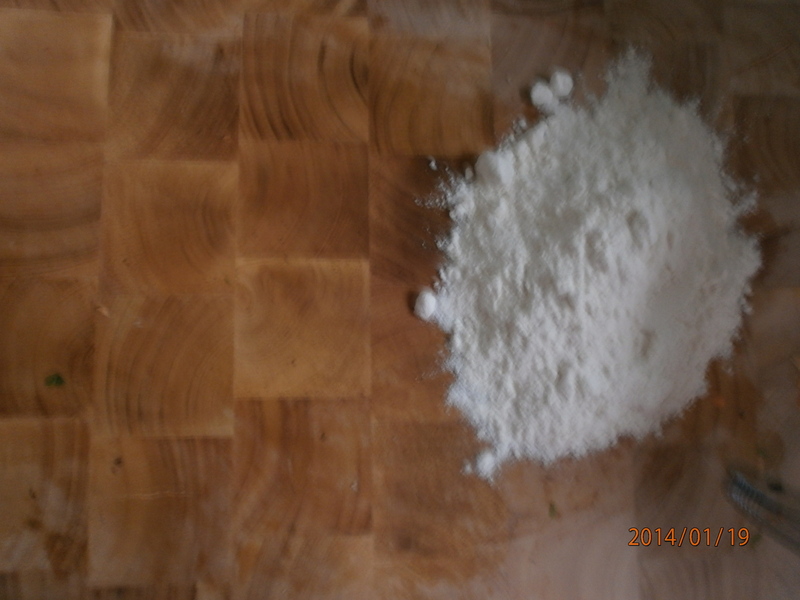 Only problem= my silicon baking mat is still back in ChCh! 😦 gah. Since I don’t exactly think I ought to go out and spend more money on more baking mats that will eventually arrive by post in ~2 weeks time, I decided that I might as well up-load what I can, for this week. 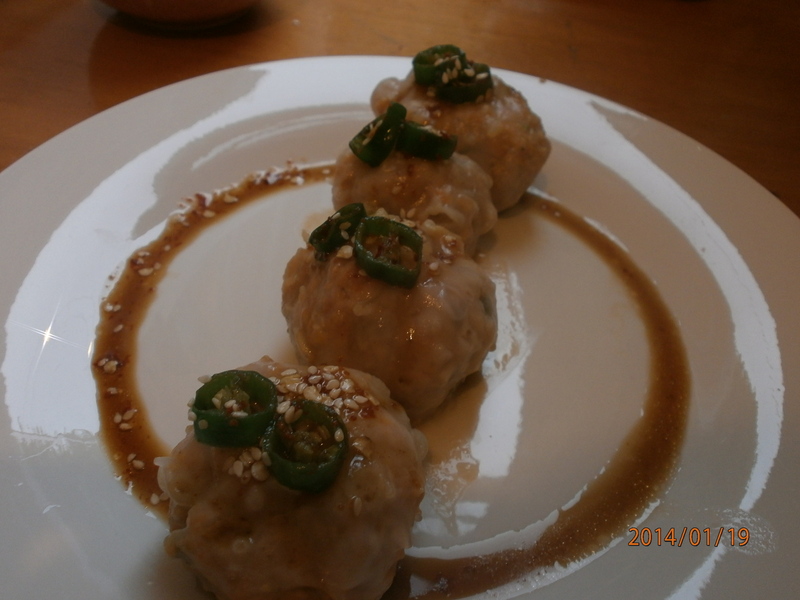 My post for this week, for a recipe I have never tried in my life: Self-cashing dumplings (Korean style). 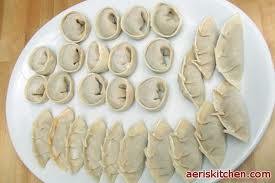 Now I know that some people think that dumplings=all same. But the truth is, they are not. 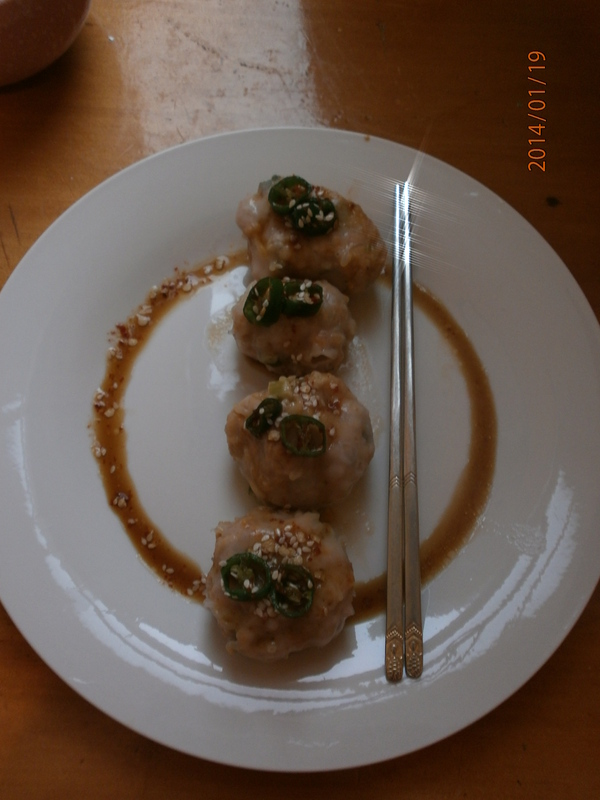 I have eaten my fair share of Northern Chinese style dumplings, yum char bites, as well as Korean frozen/home-made dumplings. I can assure you that they taste quite different. It’s like this: Apple Tarte-tartin vs apple-pie. Both sweet. Both involves baking. But if you have eaten them, you will know they are different. 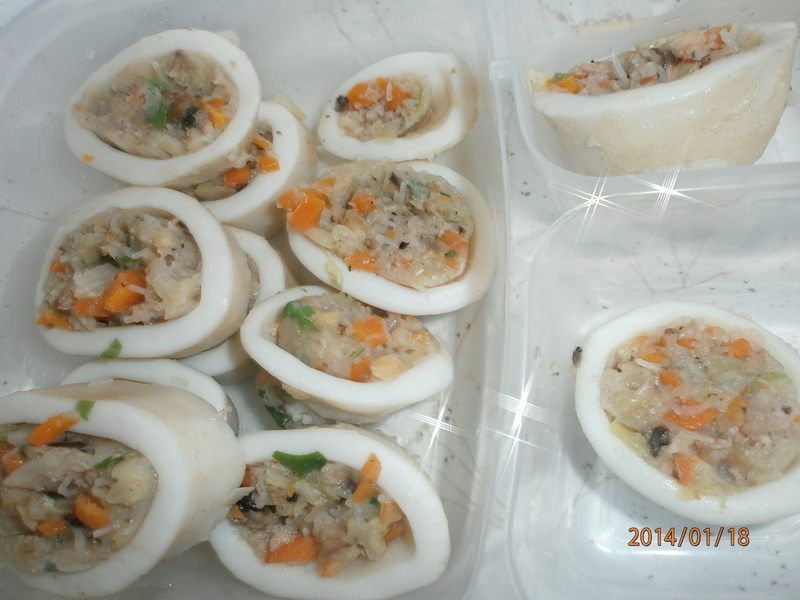 The method for making them are slightly different, and the fillings= also different as well. 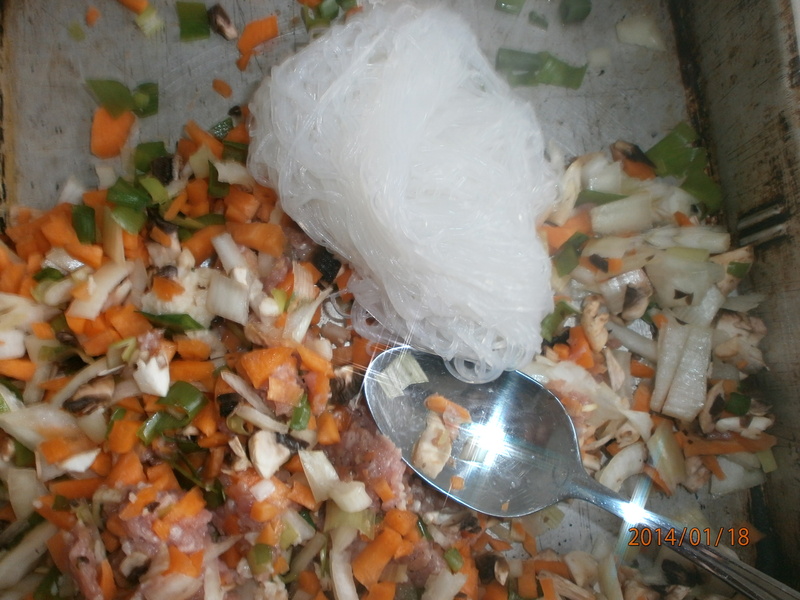 Give it a good mix~ boom shaka laka, boom shaka laka~ In mean time, we want to soak for ~30min, one bundle of vermicelli. 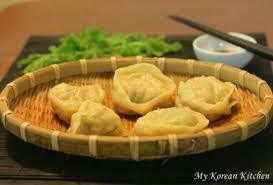 Now this is why this is NOT authentically Korean, as authentic Korean mandu=never uses vermicelli. 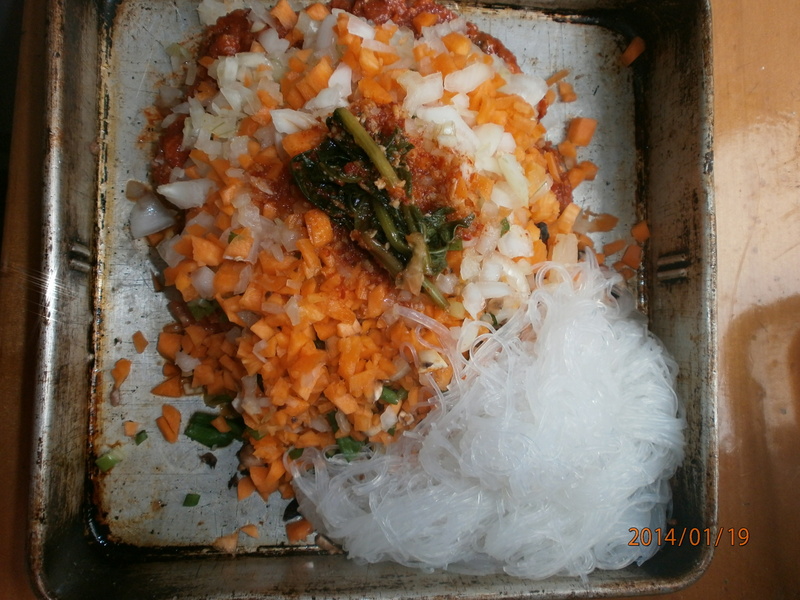 They use dry noodles made of sweet-potatoe starch. 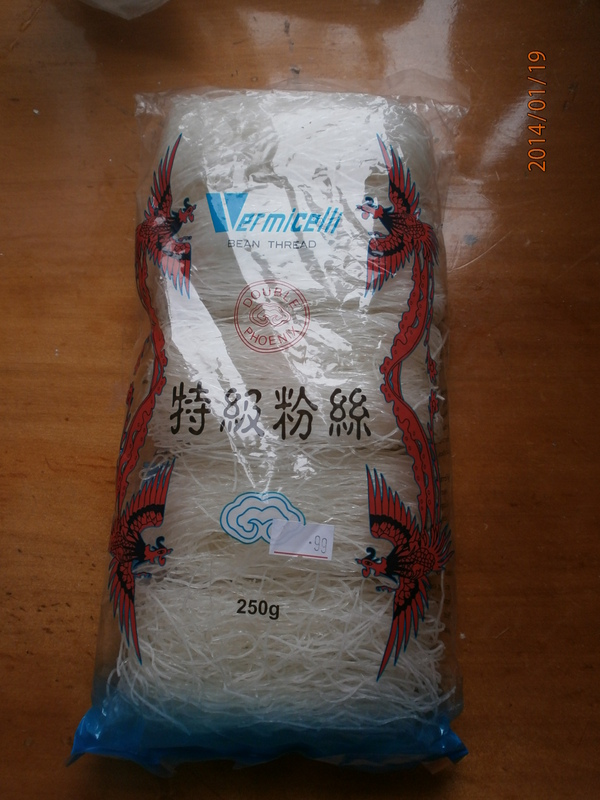 However, these vermicelli were 99 cents (NZ)! 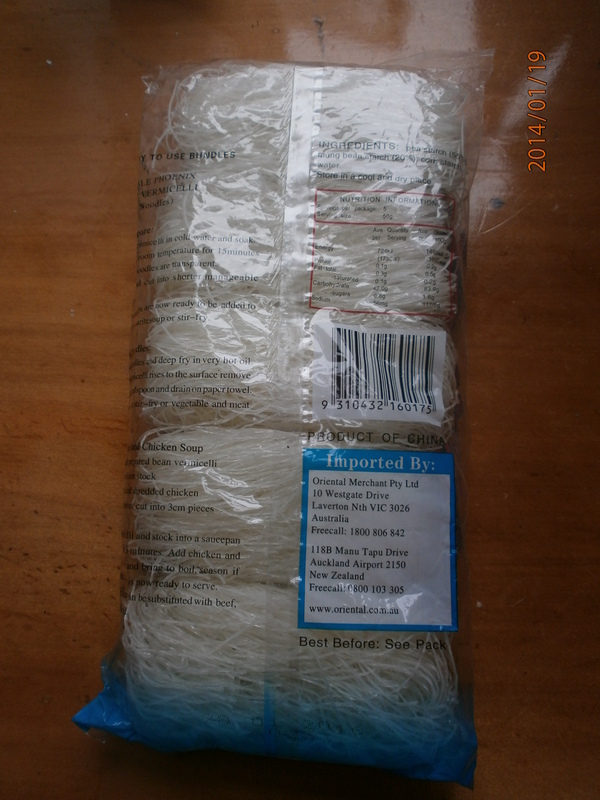 These are the same vermicelli I used for the stuffed-calamari recipe. That’s what the packaging looks like from the front. 🙂 This can be found across New World, Pak’n Save, Countdown- most mainstream supermarkets. 🙂 Soak one bundle in water for ~30minutes. 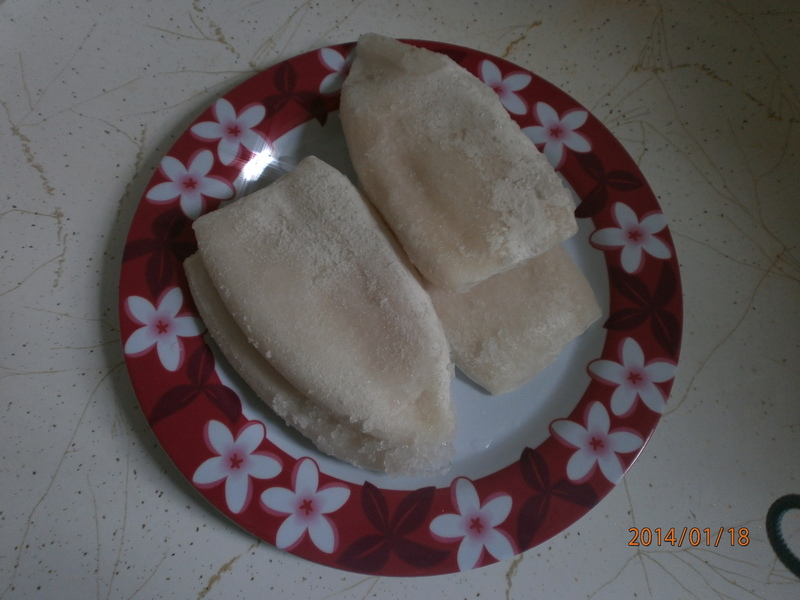 Then dip them in hot boiling water for 3minutes. Rinse. …so you roll once- and leave it- then you roll twice- you still see pink stuff, which we do not want! 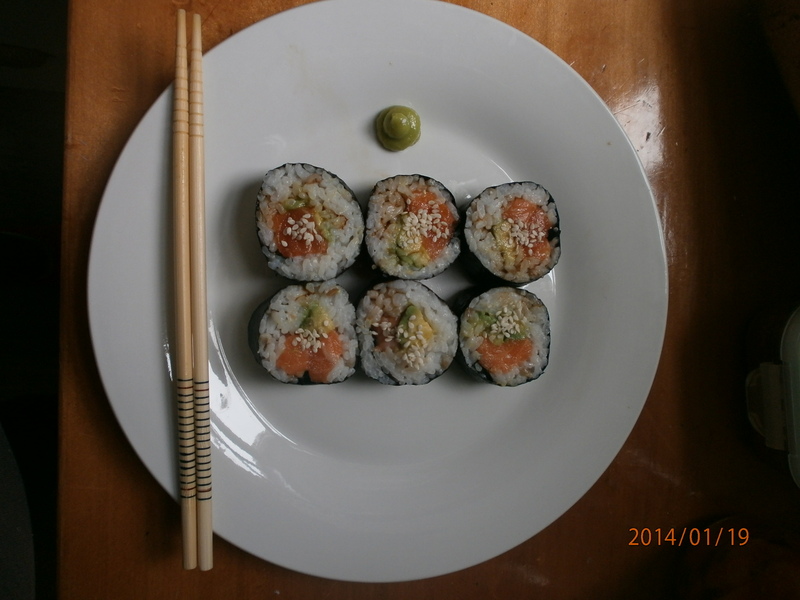 Just roll again- THIRD time this time! 😀 NOW they are ready. 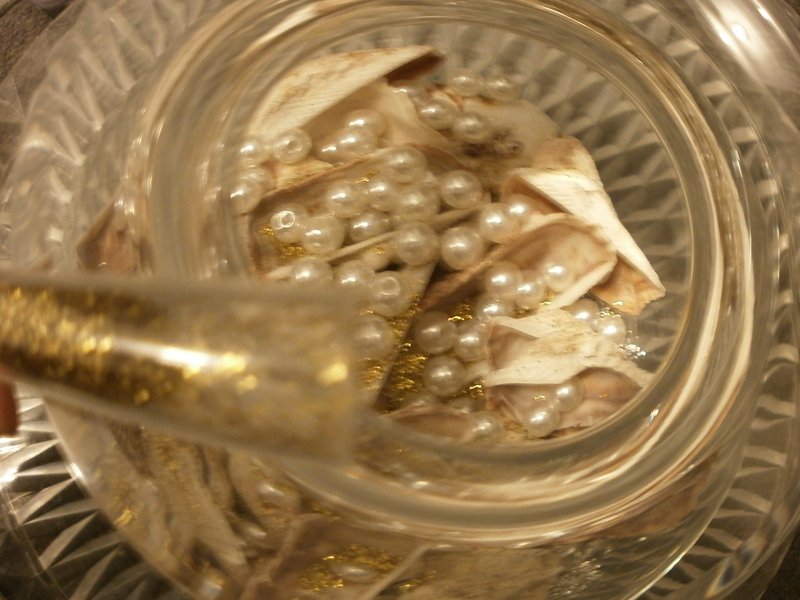 Plop them into hot boiling water, until they float. Floating= cooked. 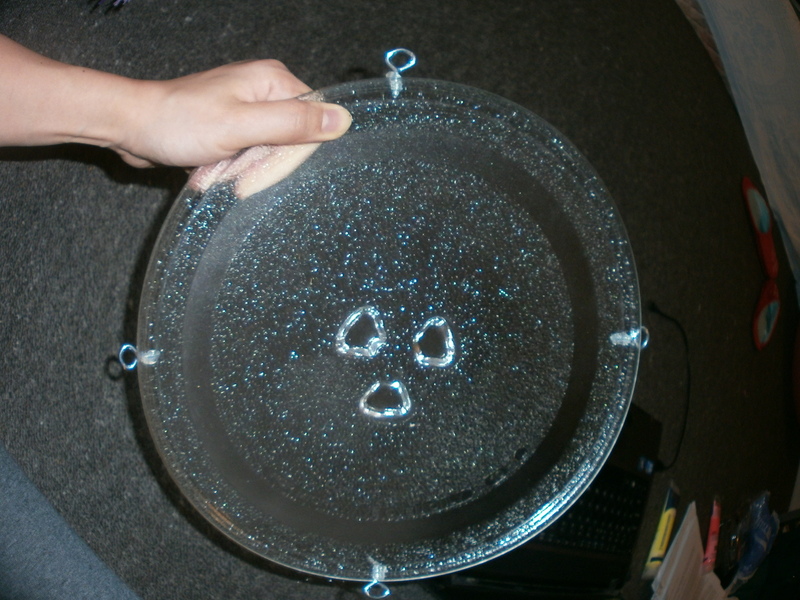 😀 🙂 I had two pots going on at the same time! For these reasons, I do not think this recipe is extreme authentic, to the tee. However, I think this is a very helpful recipe for those needing to make dumplings, but do NOT have any wrappers at home. Yet…The people, the food, the atmosphere. Call me naive, but I think I literally fell blindly in love with the place. 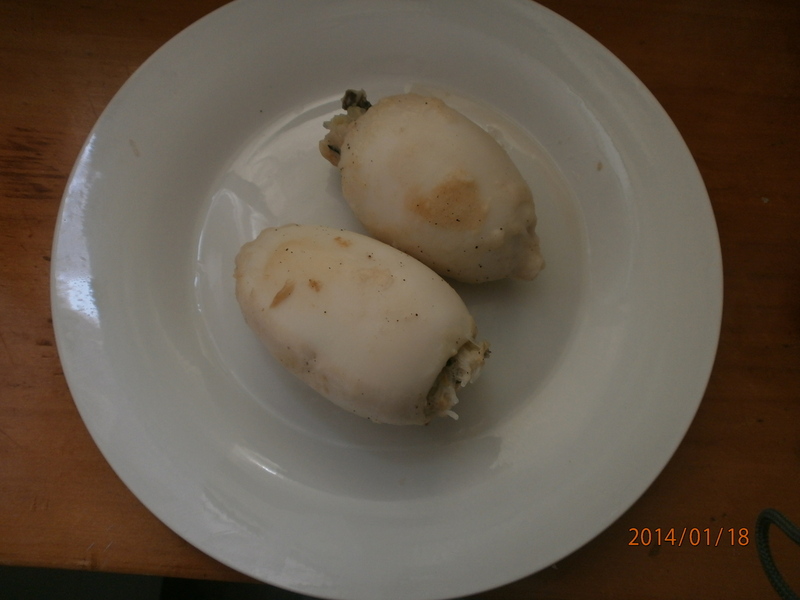 Now, it is best to use fresh calamari/squid. 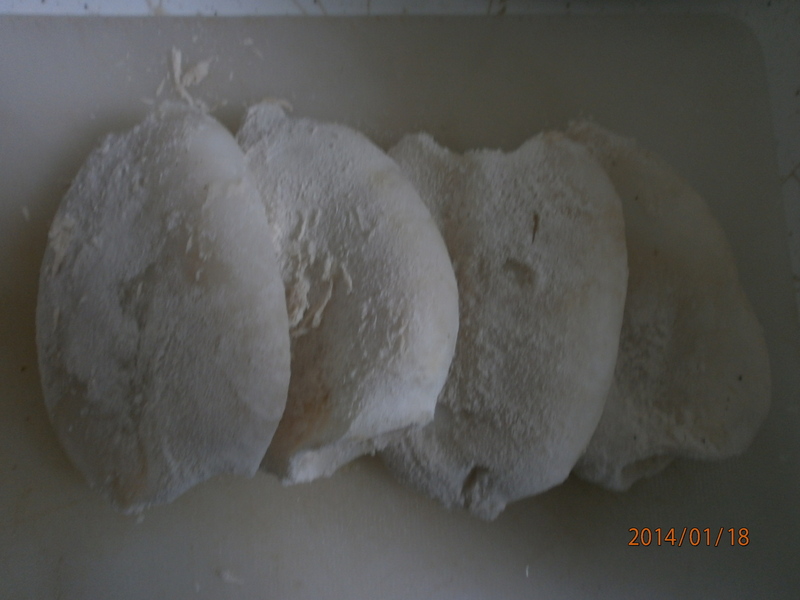 However, when you are on a budget and living in Dunedin, frozen ones are fine. 🙂 Just make sure that you check the expiry date of squid before using. Make sure that they are still fresh. 🙂 Frozen calamari can easily be found in your local supermarkets 🙂 I bought mine from New World. At this point, you want to defrost them. While you let them defrost, add a pinch of salt, a pinch of pepper and 1TBS of light sauce sauce (not dark soy sauce) and let it marinate for about ~30minutes. 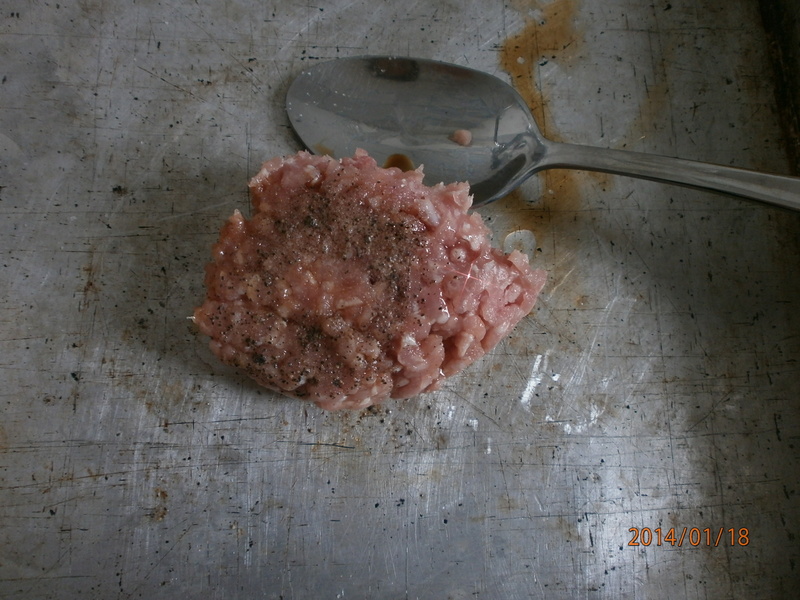 To 30g of pork mice, add a pinch of salt, a pinch of pepper, 1tsp of cooking oil (olive oil), 1tsp of light soy sauce. Mix. 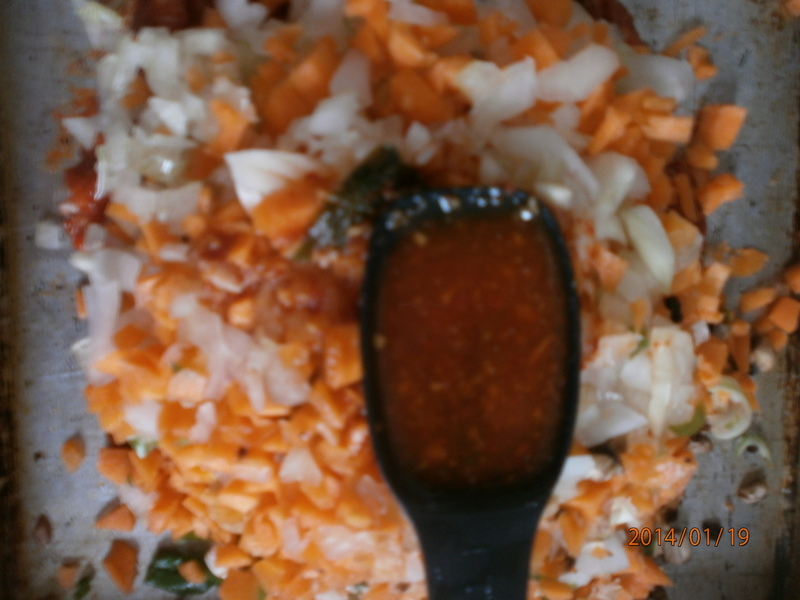 Let the mixture marinate for ~30 minutes. 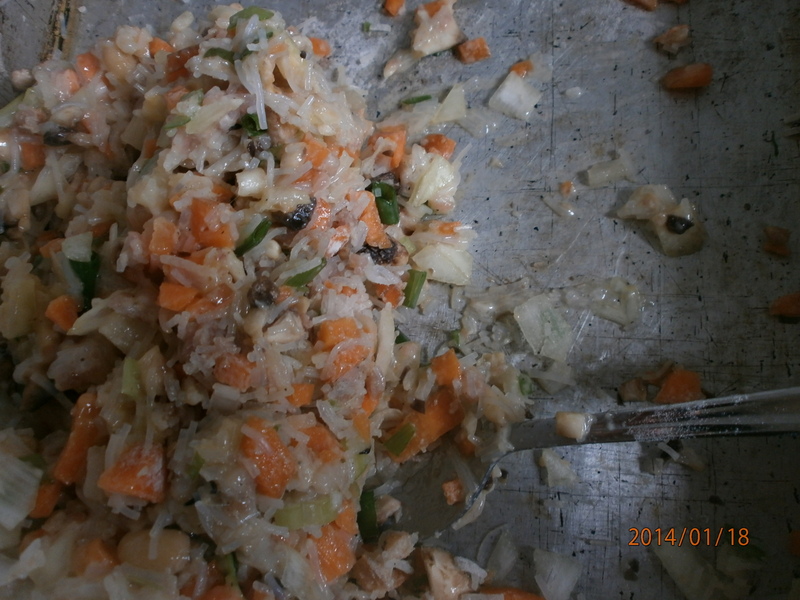 I then chopped 3/4 of the carrot above&diced it. 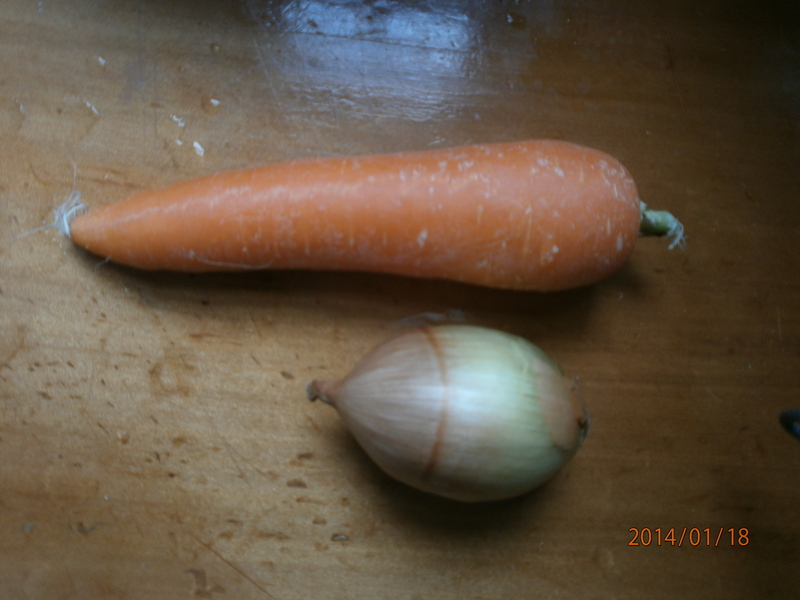 I then diced the onion above. 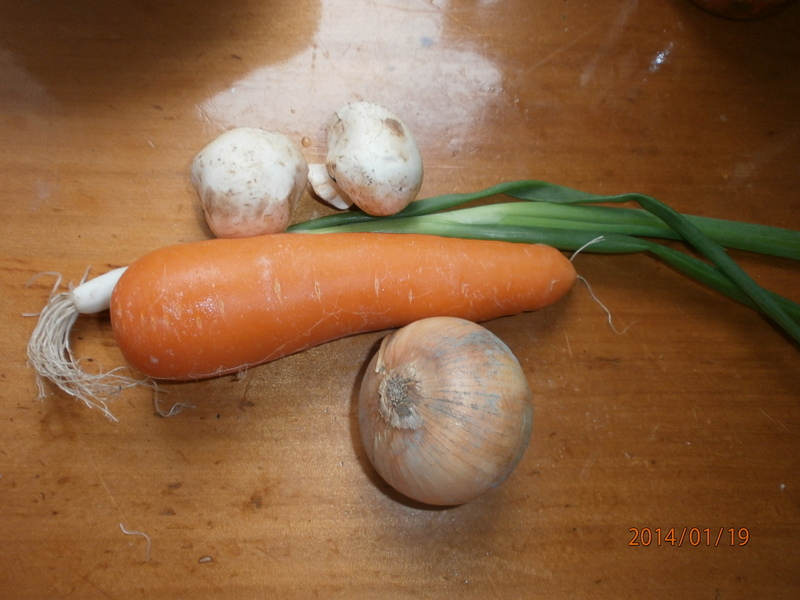 These are green spring onions. 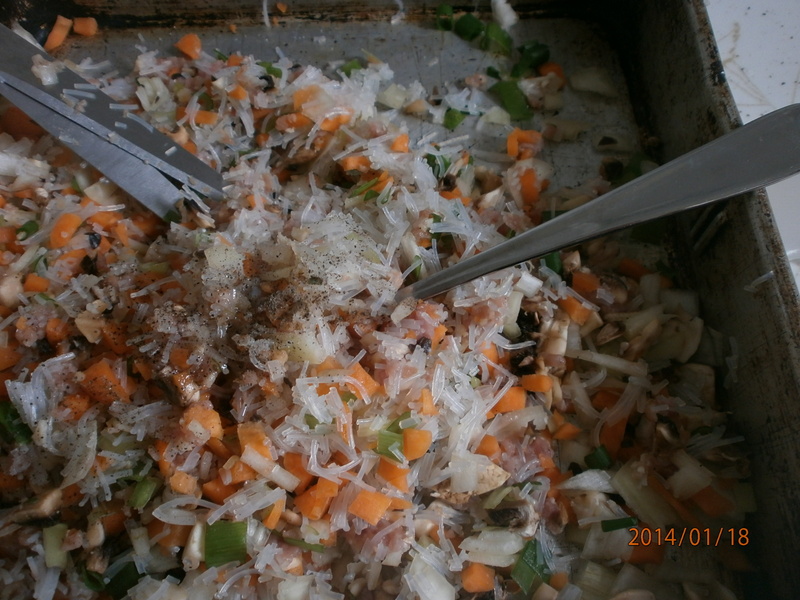 Chop them finely. Chop 2 mushrooms. 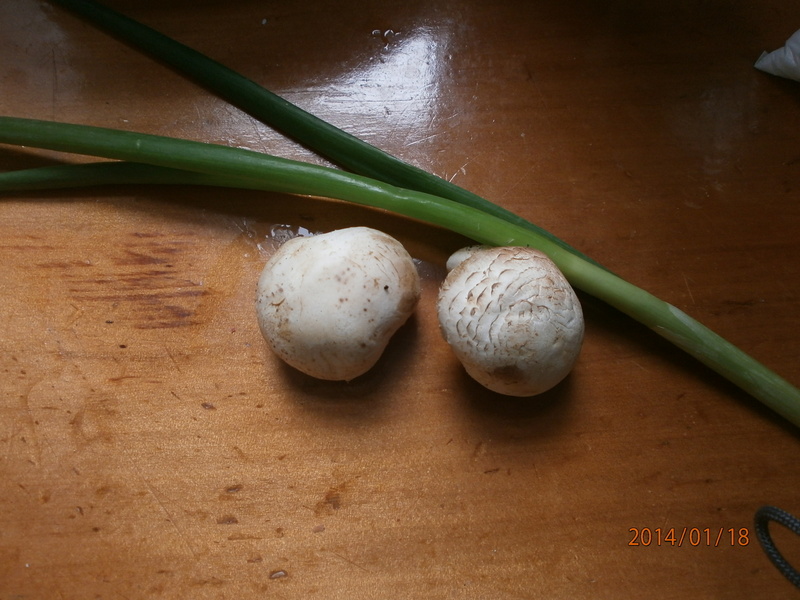 If you have the luxury of having Shiitake mushrooms, by all means, go add use those! Shiitake= more authentic. 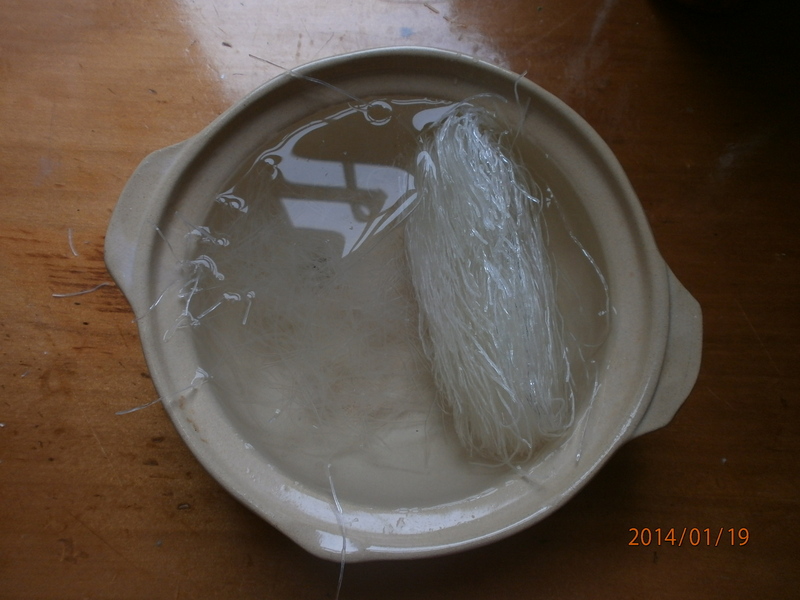 Place the soaked vermicelli into a pot of hot boiling water and boil for ~3 minutes. 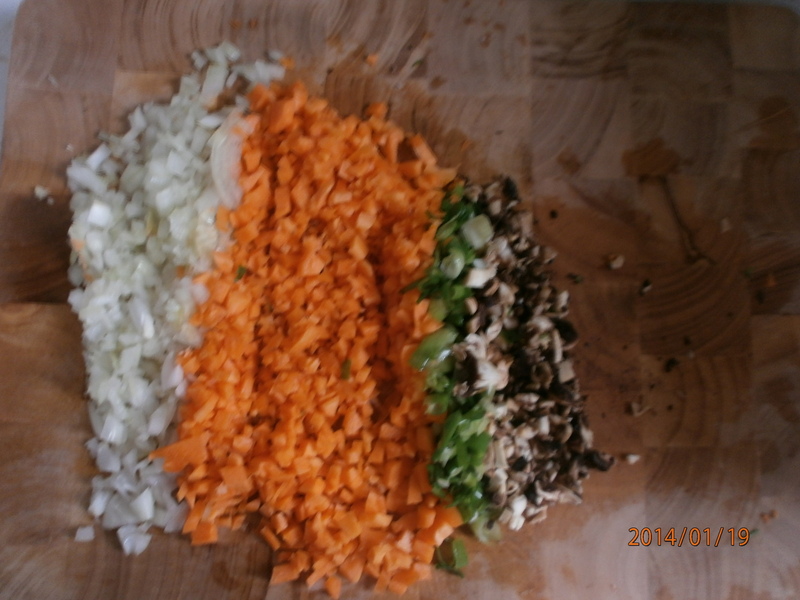 Take the noodles out and place them into the bowl where you have all the veggies+mince mix. 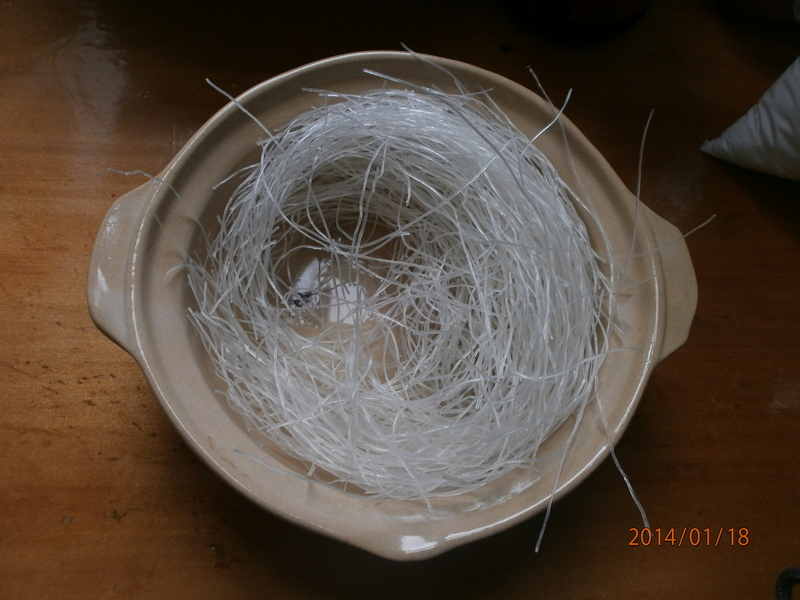 With your cooking scissors, cut up the vermicelli very finely. 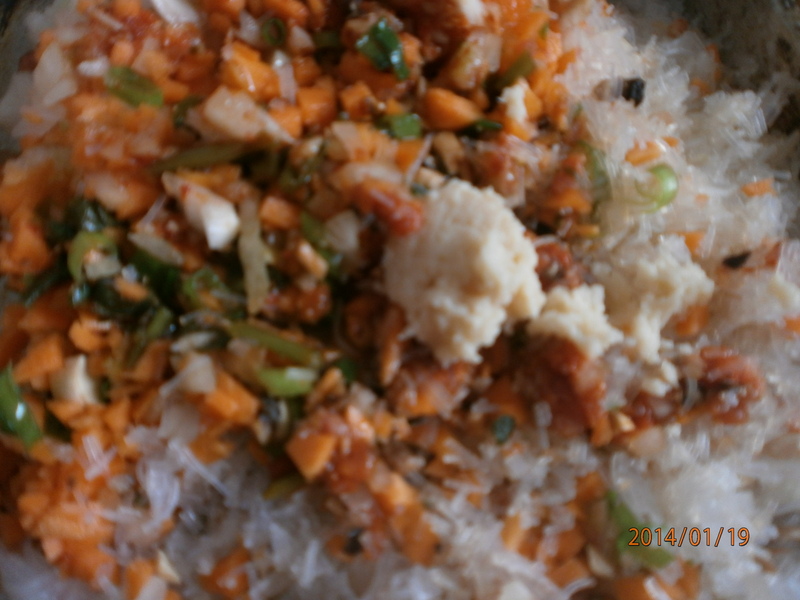 Now I know that in the original video, they ask you to chop the vermicelli BEFORE adding. 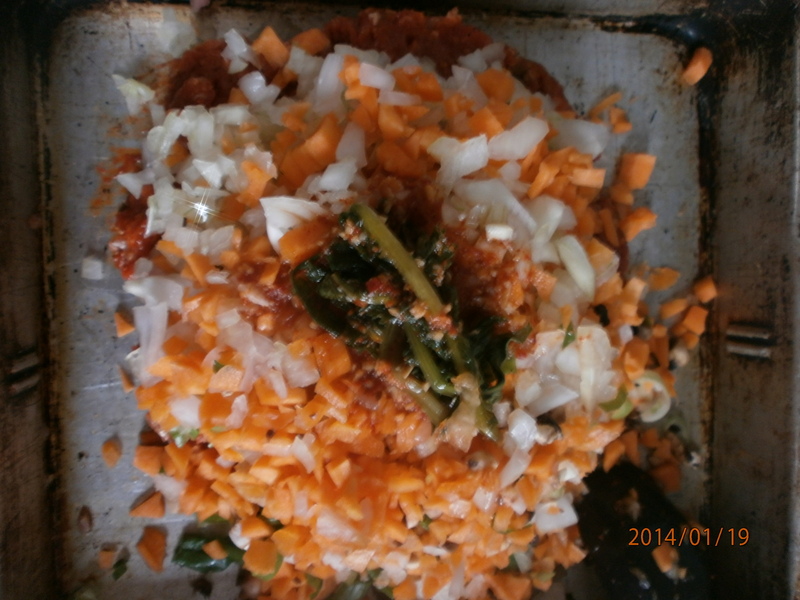 However, to save dishes 😛 I just added them to the mince/veggie mix and started to chop them finely from there. 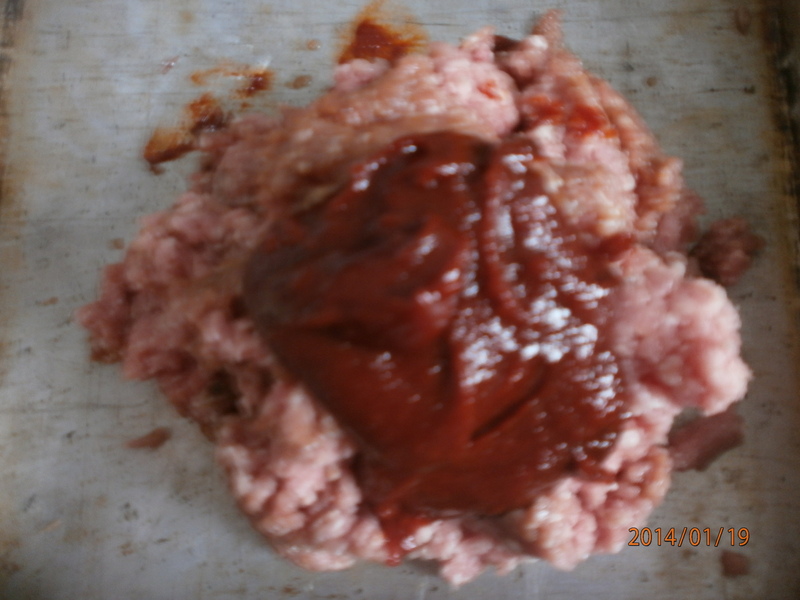 To this mix, now add 1tsp of minced garlic, a pinch of salt, a pinch of pepper and a dash of sesame oil. Mix. Now, in the original video, they ask you to add tofu. However, tofu is mega expensive here in Dunedin, when compared with Korea. I also did not have any tofu in my fridge. So I decided to skip it. 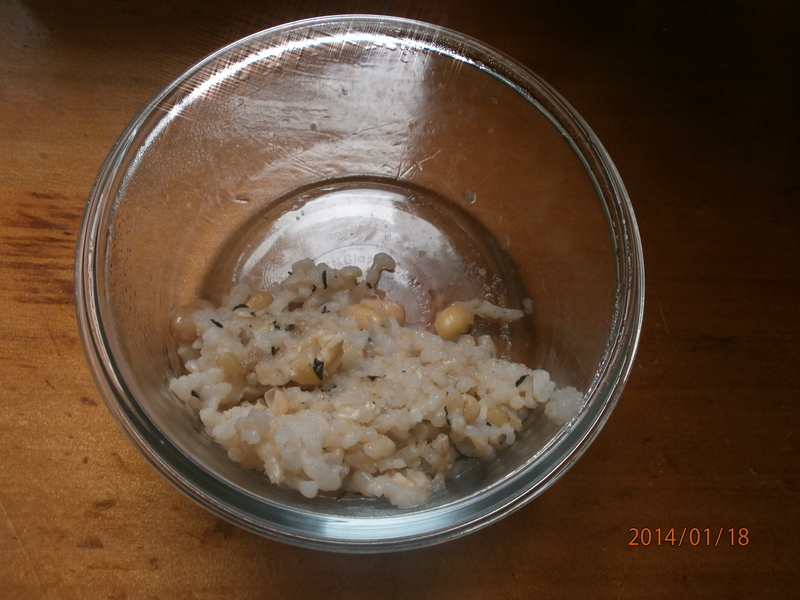 However, to add to the texture that tofu would have added(plus help bind the ingredients together), I added wee bit of my soy-bean rice, that I had in the freezer. 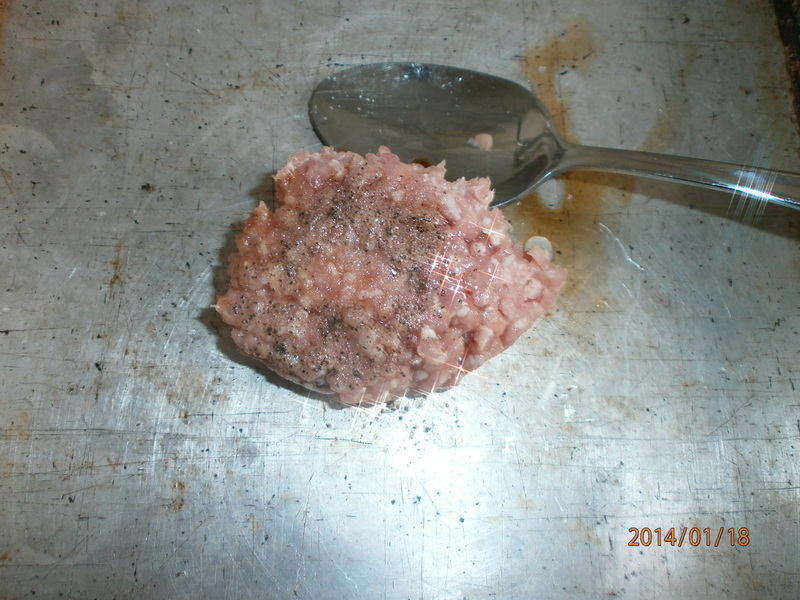 The cooked rice was defrosted before being added to the mix. At this point, you are meant to add starch. However, I did not have any. 😦 Now that sounds like I lack lots of ingredients for this dish! 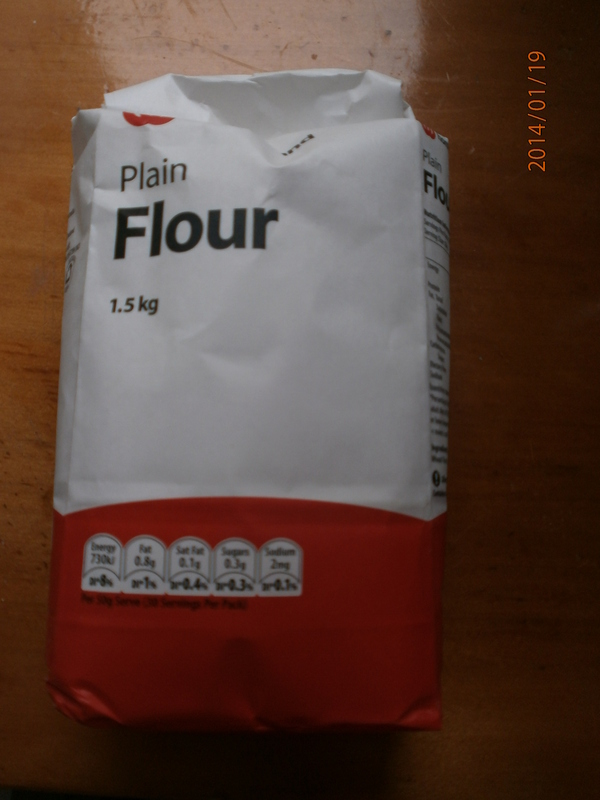 😦 Then again, I think cooking is also always about compromising, being creative, and working with what you do have…:) Hence, I added 1/3 cup of plain flour to help bind the whole thing. 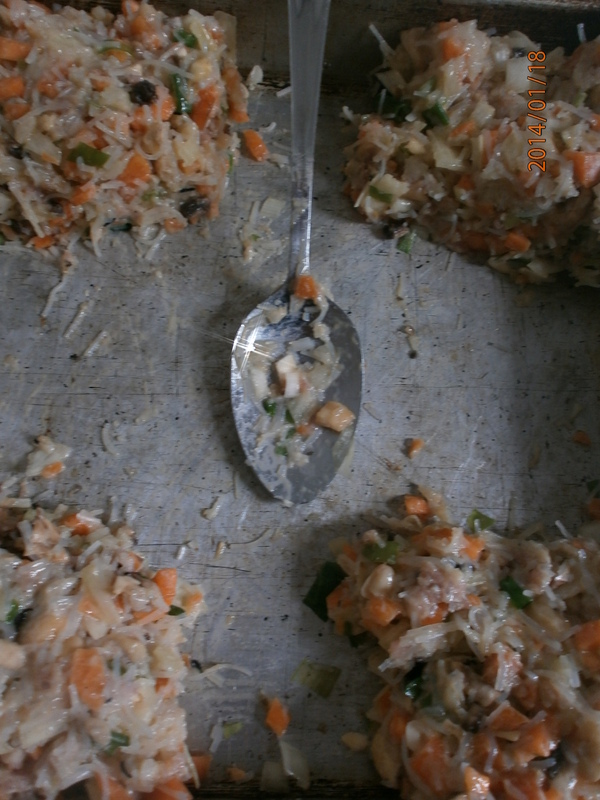 After cracking an egg into it (size 8 egg), I divided my stuffing mix into 4 parts. This is because I had 4 calamari to stuff. 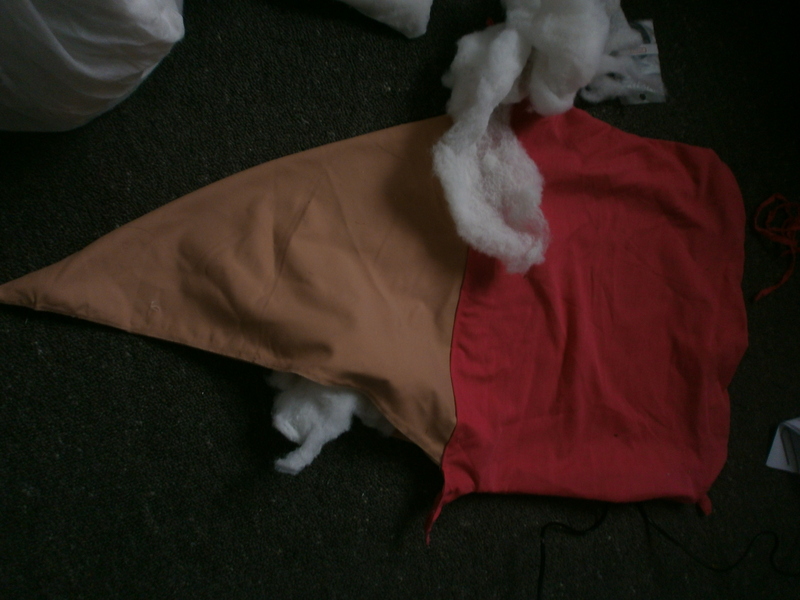 Now this part was kinda hard to take pics of…So basically, you coat the inside of the calamari with flour. 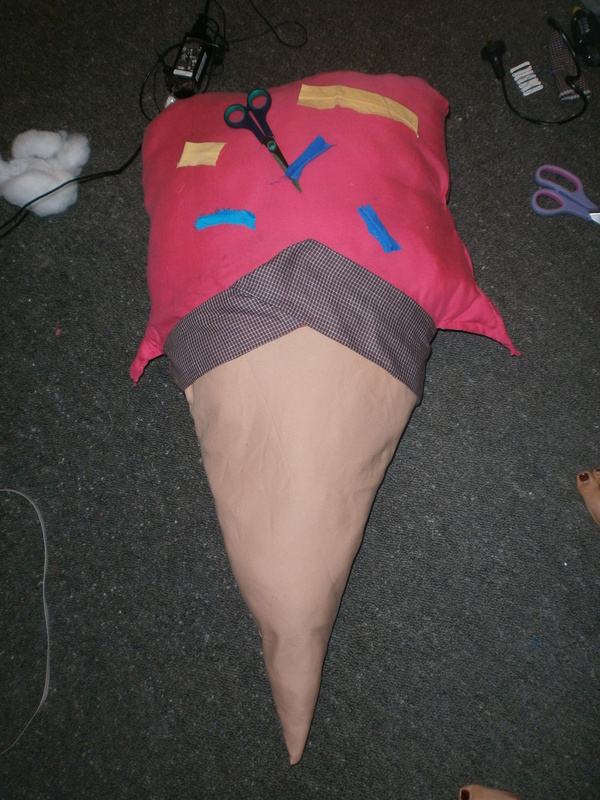 Once this is done, you then start stuffing. After this, you are meant to steam it. 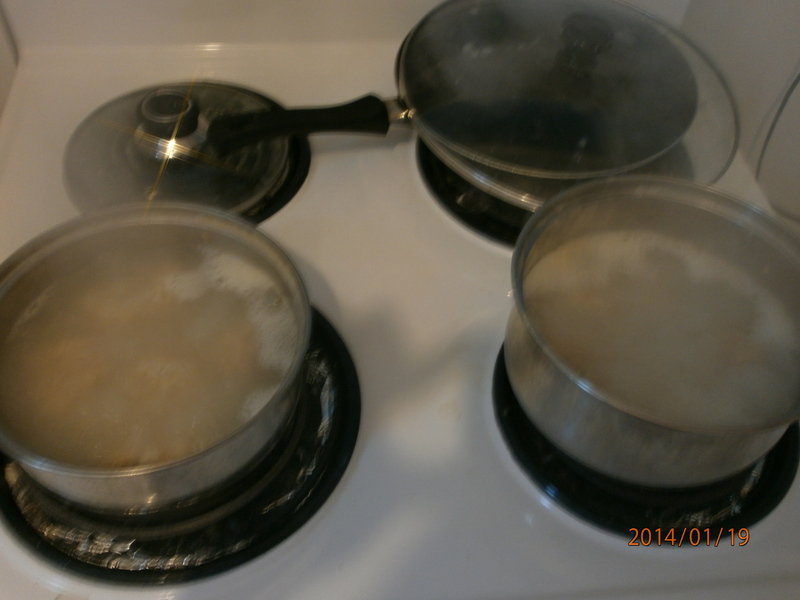 However, I do not own a steamer… 😦 So I tried the poaching method. NOTE: Before you stuff the calamari, dip them in a pot with hot water for ~3minutes. Take the calamari out and let them cool. 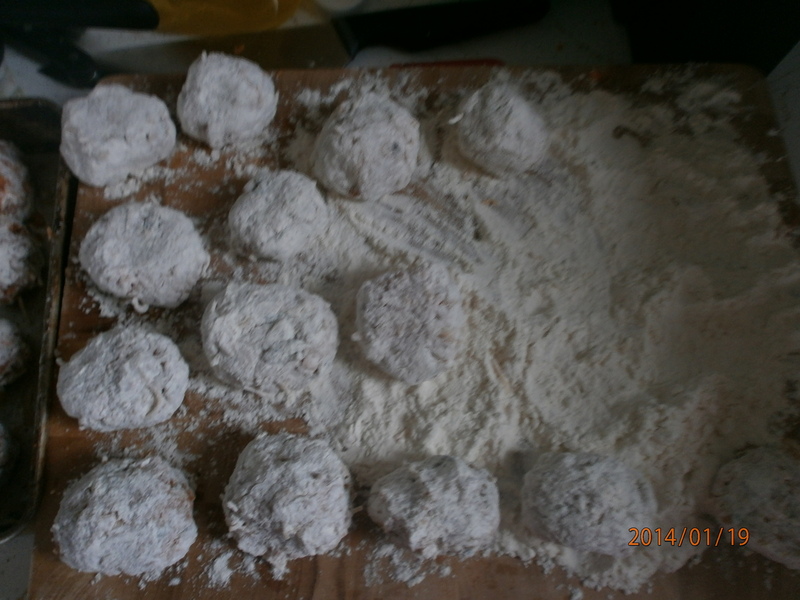 Once they are cool, then you can coat with flour and begin the stuffing process. Worked fine with me! 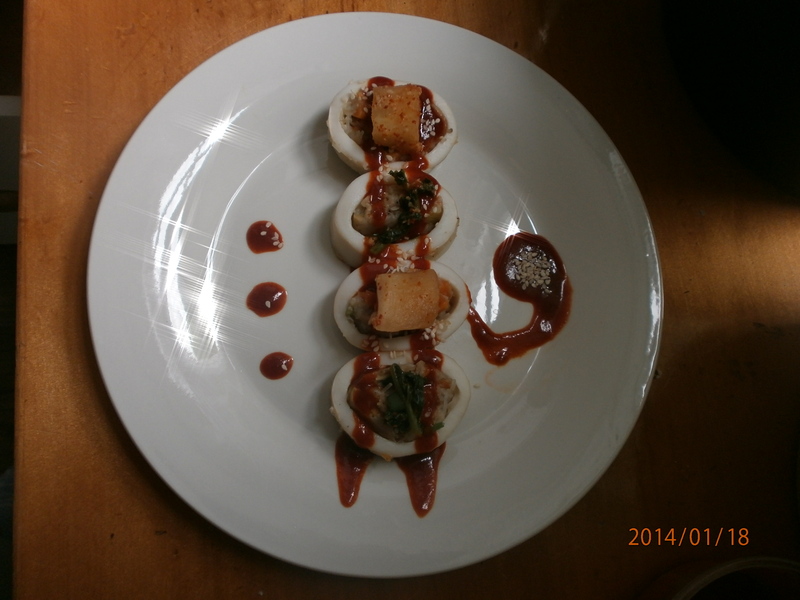 The stuffed calamari were poached ~15 minutes in medium high heat. 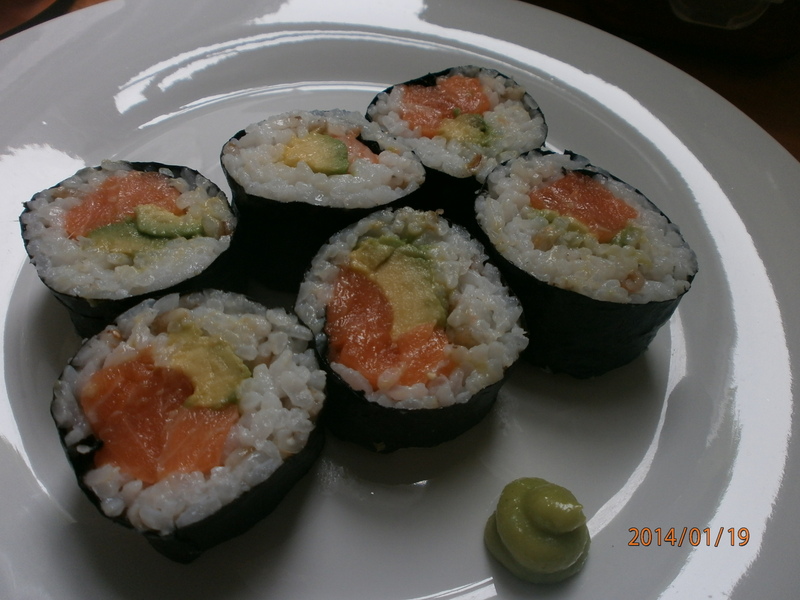 They were then allowed to cool, before being sliced like well…Sushi! 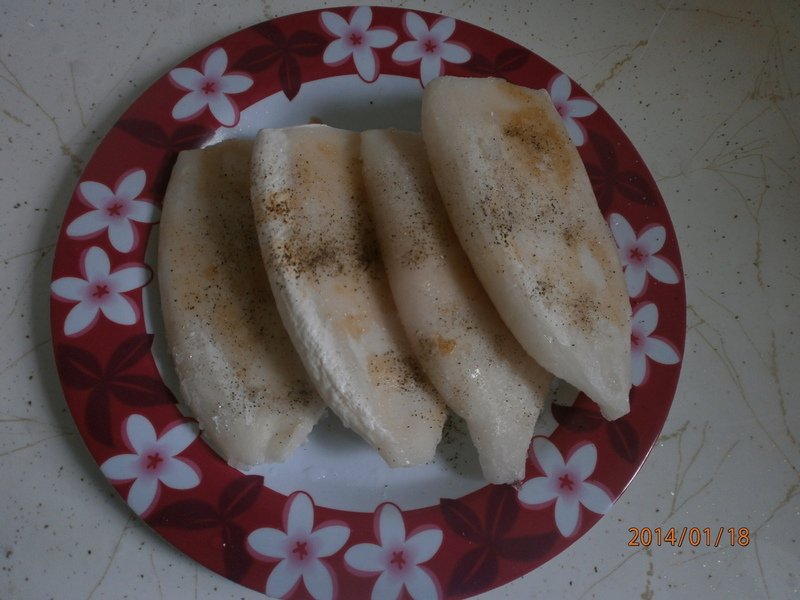 At this point, the video says we should dip them in egg and pan-fry until golden brown… However, I had ran out of eggs and also did not feel like pan-frying extremely soft squid, cooked and ready for eating. Now I am sure that most Koreans would agree that with seafood, especially 오징어, seafood goes well with chili sauce and vinegar. 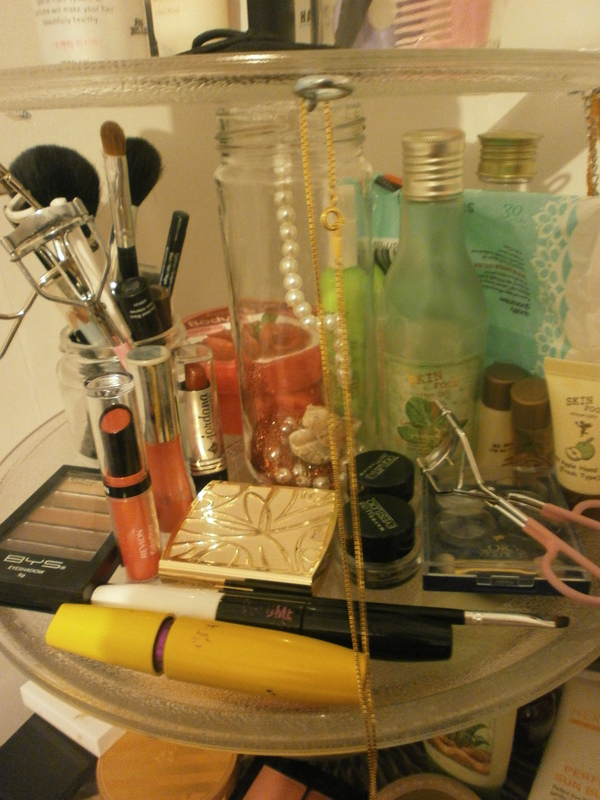 So I did a compromise. 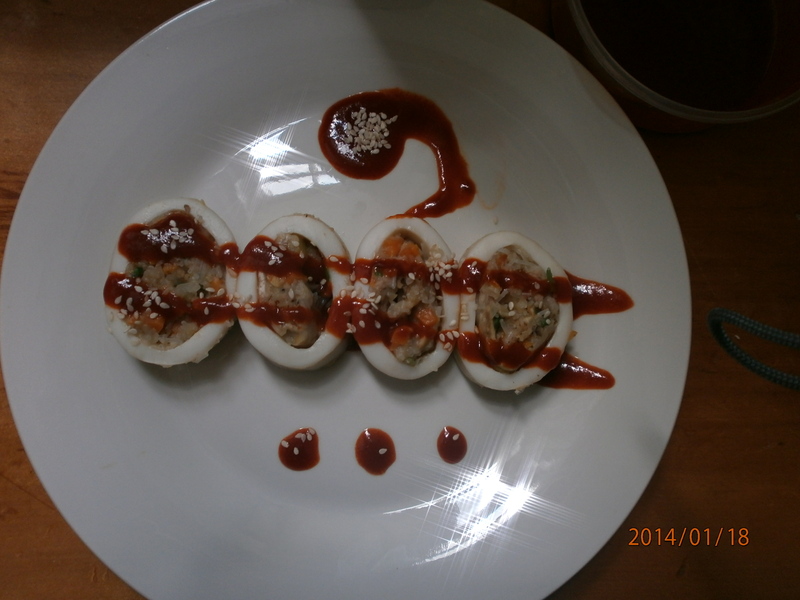 Instead of dipping them in eggs and pan-frying the stuffed calamari, I simply made a simple, yet classic Korean dipping sauce: 2 TBS of gochujung (Korean chilli paste), a splash of vinegar, a squeeze of lemon, 1 TBS of white sugar. Just mix all of this. How much vinegar= will affect your consistency of the sauce. Lastly but not least, add sesame-seeds! If you have time, toast them. 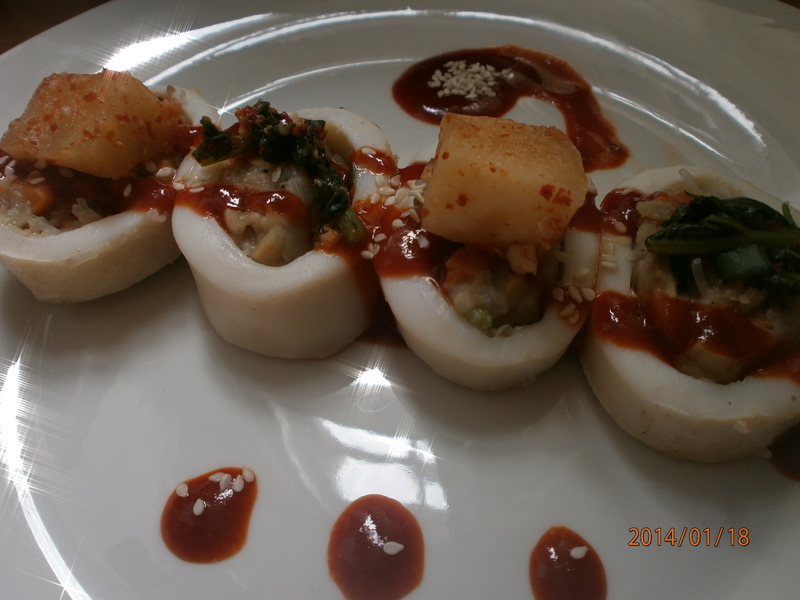 To add a crunchy texture to the otherwise soft-textured dish, I then added home-made Korean chilli radish cubes on top. 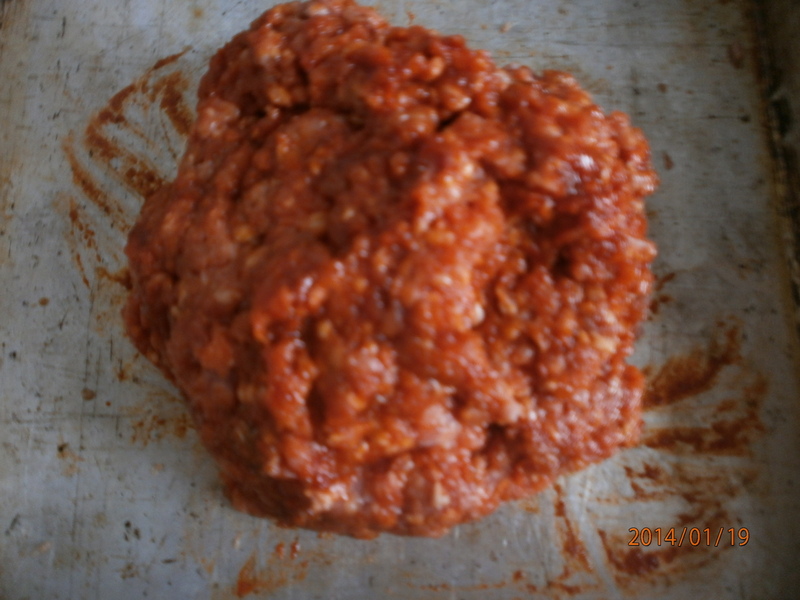 Store the left-overs after they have been cooled in the fridge for up to a week, or repeat the procedures above, depending on how many guests you have. 🙂 These also go well with the classic light soy-sauce+sesame oil+vinegar+chives+chilli flakes dipping sauce.